I had a bacon breakfast on Monday and watched more of RuPaul's Drag Race season 3 with Eva. I think this is my least favourite season so far. Partially because I know Raja wins and so far I'm not a big Raja fan. I do love Shangela and Manila though. After that I watched more hamster videos and then had a shower. That evening I worked on Tuesday's post before having some more Rue bonding time. 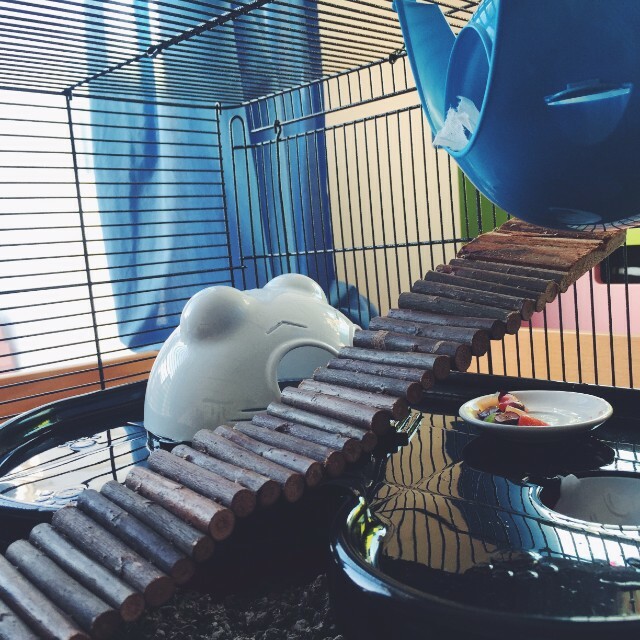 Bonding with her in that tiny cage was difficult as there's only one tiny door on the top. So I was basically just letting her get used to my hands and such. By the end of the evening she was letting me scoop her up in my hand in the cage. Which was helpful to pry her away from the bars she just loves munching on. Edwin was determined to watch her the whole time. He's truly obsessed by his little sister. Rue decided when she'd had enough and decided to curl up for another nap. That was my cue to have supper and get myself to bed! I had an early start on Tuesday as Eva was taking me to my doctor appointment. Mine was at 10:20am but Eva had one herself at 9:40am. We figured it was best to kill two birds with one stone. The appointment was a check up to see how I was getting along on my antidepressants. I told him about feeling tired a lot and some of the intrusive thoughts I've been having since, but that the anxiety was much the same. I didn't want the dosage changed or anything because it's still early days so we agreed I would just keep going and have another appointment with him at the end of this script to see how I am. Eva and I were going to get a sandwich from Curious Cat for breakfast but it was closed so we ventured into town instead and got one from the Heatherlea. We brought it home and watched RuPaul's Drag Race while we ate. I posted up my Miscellaneous Tuesday post and decided to start a new series, Pets 'n' Stuff. You can check it out here. 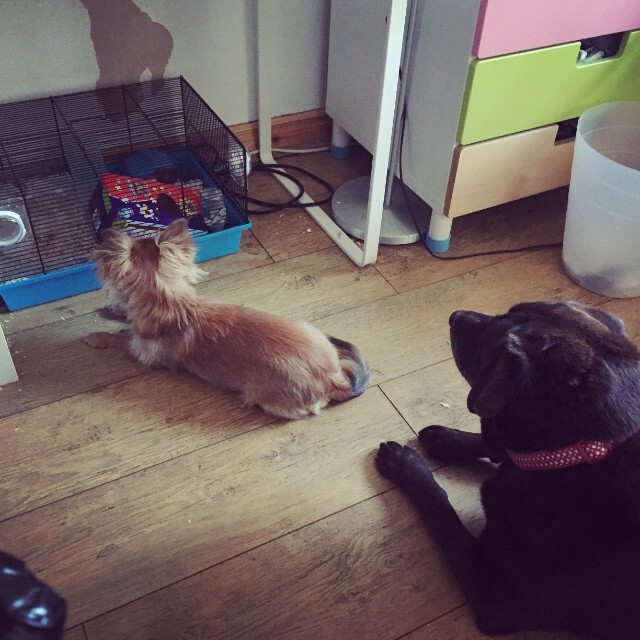 I'm looking forward to writing more pet and animal themed posts as they're such a big part of my life. Later that evening I had an optician's appointment. It went okay but I had to get new glasses. My right eye is slightly worse but my left eye is worse still. I love the glasses I have already but it was almost £40 to have them re-lensed while it only cost me £69 for two pairs of glasses as from £69 up it's buy one get one free. Eva picked both pairs out for me and I really like them. They're much lighter and a better fit than the ones I currently have. Still, I may have them re-lensed at some point. Or at least my tortoise shell ones. 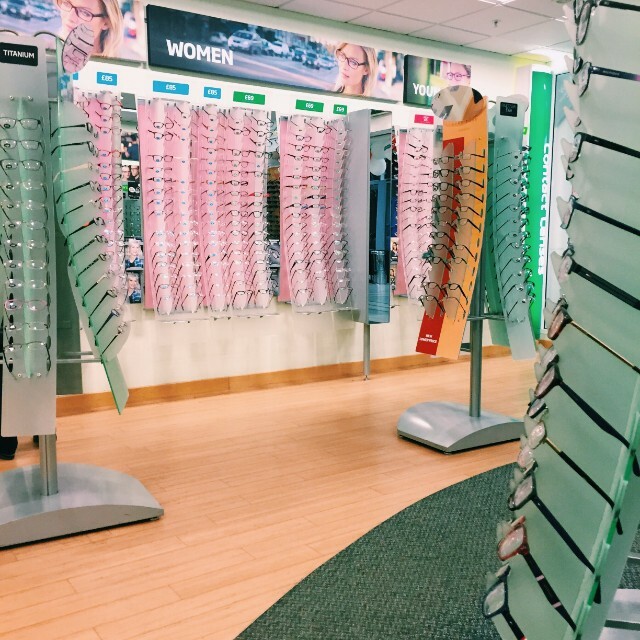 They didn't have the lenses in stock so I couldn't pick them up until Friday. 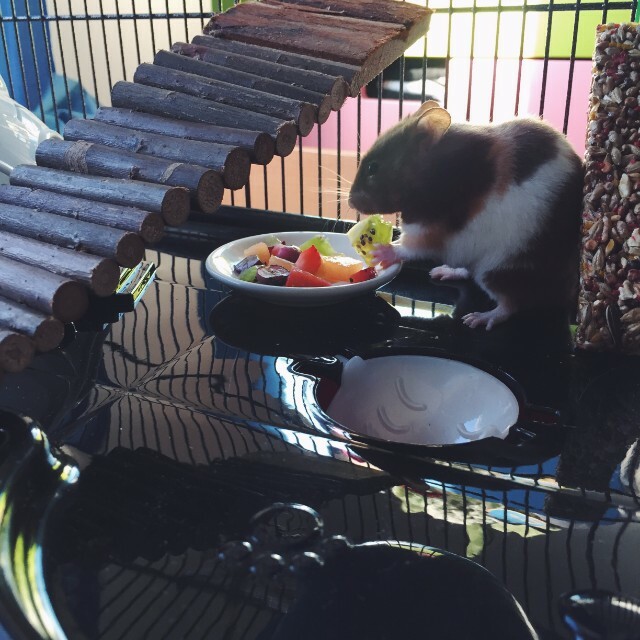 After that Eva and I headed over to Pets At Home and spent a BOMB on hamster stuff for their new cages. The girl in the store was gob smacked. I didn't actually take photos of what I bought but a lot was featured in the wish list I posted on Tuesday. On Wednesday all THIS arrived. Our cages! Zooplus ship from Germany so I didn't think they would get here so soon. I was so glad it did though as I hated Rue being stuck in that tiny cage. Eva set about putting the cages together and they turned out looking a lot bigger than we'd anticipated. 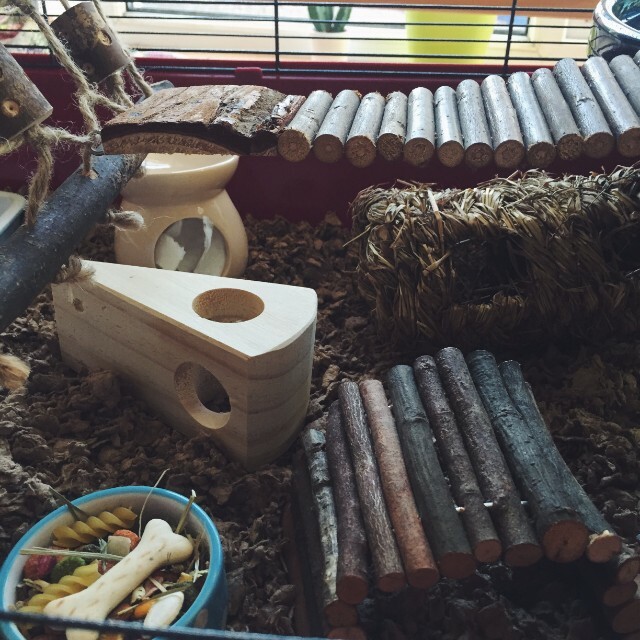 I got her cage all set up and I have to say I was really glad I got all the toys for her the night before. I think her cage looked pretty good if I do say so myself. Here's some I took before I put her in. The empty blue bowl was going to be her sand bath but we weren't able to find any chinchilla sand. 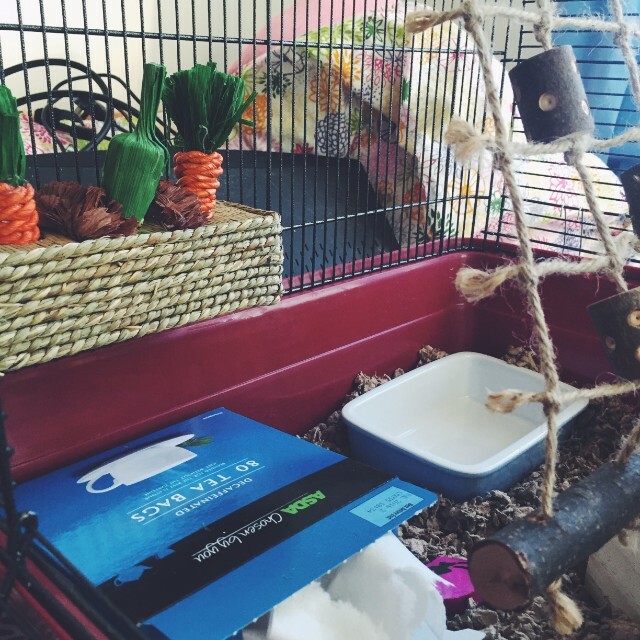 I was really happy with her cage and then it all kind of went down hill from there. 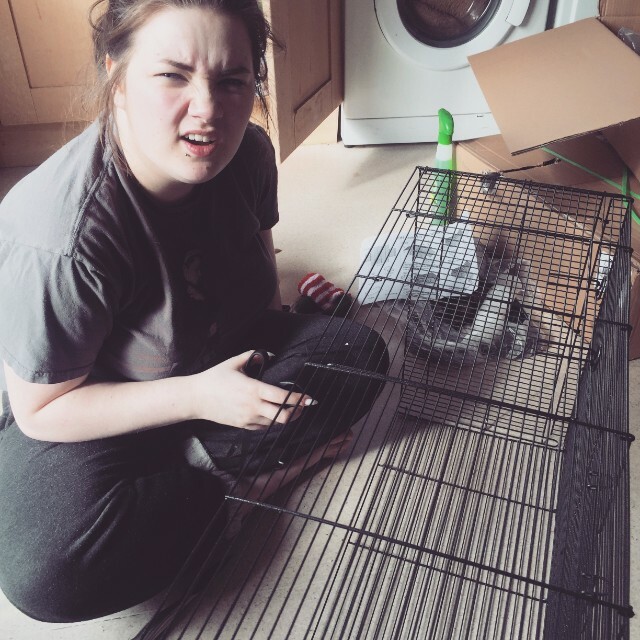 Eva and I showed our mum our new cages and lets just say she was less than impressed by the size of them. An argument ensued and my mum ended up crying. All made worse by the fact it was her birthday! Talk about coming down from a high and feeling rubbish. Luckily she did get over it. She's just worried that when we move out we're not going to be allowed to take our pets. Truth be told it's a worry for me too... but I'm not going to dwell on that in this post or my anxiety will pay a visit. Anyway! After all that Eva helped me tidy and clear my room as I had to get rid of my television, stand and Xbox to make room for Rue's new cage. 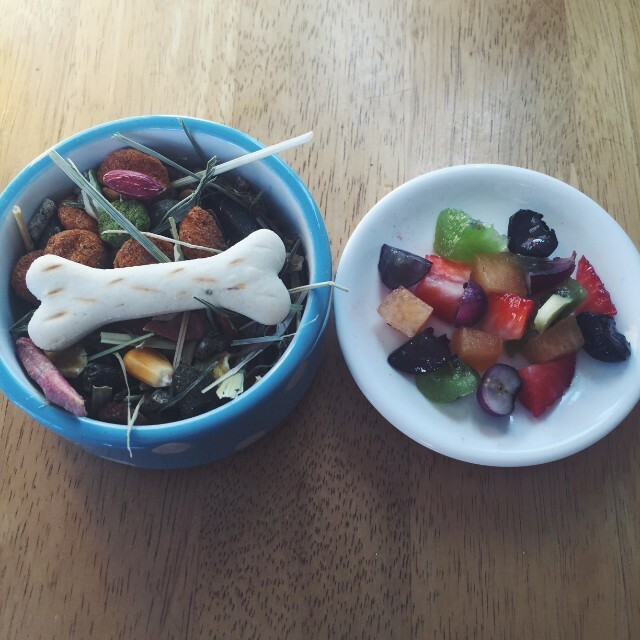 I then prepared Rue's dinner and a little fruit salad on a tiny plate. Then I put her in! 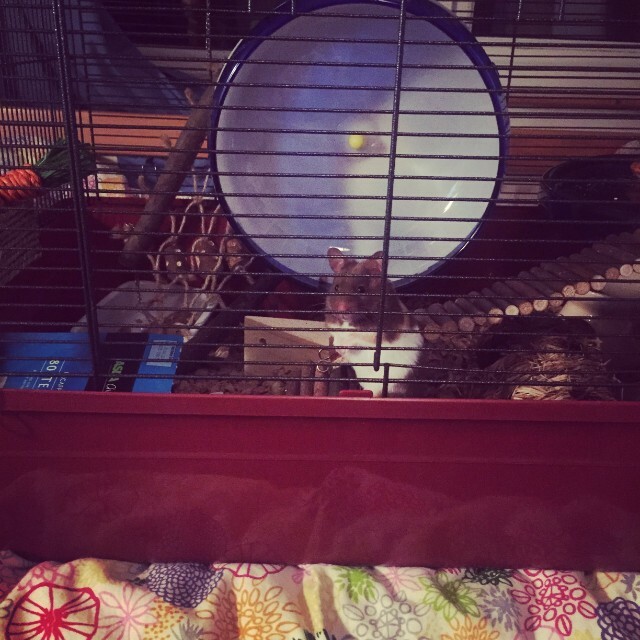 And if I had had any regret getting such a big cage because of my parent's reaction, it disappeared once I seen how much Rue loved the space and all the toys. She loved running around exploring and especially loved digging through the thick layer of substrate! She also enjoyed the fruit salad as you can see. While I left her to explore and settle in I put together Thursday's post. A film review of North Sea Texas. You can read that here. All in all the day ended on a high note as I finally bit the bullet and held Rue properly for the first time. I was afraid at first in case she got away from me but I realised I couldn't let that put me off forever. She was so good. I wish I gotten a picture to mark the occasion. The only problem is now she knows where the door is she wants out ALL THE TIME. 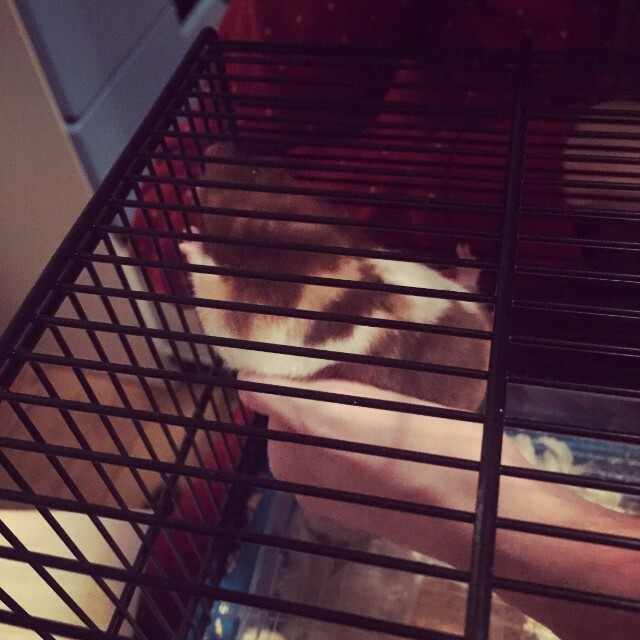 I never remember having a hamster that so blatantly begged for attention. She sits looking at me or chewing on the bars of the door. She's very hard to resist but alas I had to go to bed. Oh another highlight on Wednesday was I got an email offering a 'crafty collaboration' because of my blog! I'm really looking forward to trying my hand at something crafty on my bucket list. It's a little surreal being offered to do something for free because of my blog. It never occurred to me that could happen. So yeah, you could say Wednesday was a bit of a roller coaster! Thursday I was by myself a lot of the day because everyone was at work. Class was called off that night as the tutor was busy but she'd given us an essay homework that had to be handed in on Friday. I decided to write it while everyone was out of the house and emailed it to her. I felt very productive not leaving it to the last moment like I usually do. The essay question is 'Is sport always a positive influence?' It was a difficult one because I love sport so much but don't think anything is always a positive influence. I hope answered it well and I'm looking forward to getting the feedback. After that I just browsed online and chatted to people. I'm trying to make more of an effort to talk to people as I've been feeling a little lonely lately. I also worked on a special post for Saturday which I really enjoyed writing. When Eva came home we opened some mail that had arrived that day. Rue's wheel had finally arrived. However it was a bit stiff and even though I've not fixed it she doesn't seem fussed. Oh well. The rest of the evening was spent playing with Rue and chatting online. Below you can see what I mean about her 'please get me out' face. How could anyone resist her? Again I was by myself a lot of Friday as everyone was working. I watched the latest The Vampire Diaries episode, chatted online and after making myself lunch I watched more Spartacus. It was a nice relaxing day. I ordered more stuff from Zooplus and told myself it is the last hamster order for a long time! I've spent a fortune on her. It's addictive. I also worked on this post and then had my nightly ritual of playing with Rue when she wakes up. I had her cage door open and resting on the arm of my chair like a platform and my hoody on it and the arms of the hoodie in the cage. She was digging in the fabric of it and using the arms like tunnels. She was fully loving life. She got so excited at one point she almost bounced out of my arms. Earlier in the day she'd been rolling about her sandless sand bath as we were waiting for the sand to arrive. However I decided not to use the bowl and instead my dad got me a glass tea jar that sits at an angle so I'd be able to make it deeper and harder to kick the sand out of. Eva had the idea to fill it with substrate to dig in in the mean time. It was an amazing idea and she LOVED it. I wish I had gotten a video of her digging through it. Saturday was a BIG day. During the week Eva and I had been invited to the Red Panda Chinese for dinner before the Saturday Belfast Giants game for a birthday tea for one of the girls we'd met at the Giants a couple of weeks before. I'm usually too shy but I thought it was really nice of them to include us and I really want to get to know people. Plus they had been so lovely the first time we'd met them and I'd been chatting to Emma on Facebook a little bit, I didn't think I'd feel awkward. Anyway, we had to get the 2pm train and anyone that really knows me knows I'm always running late. However first things first, we had to open some mail! 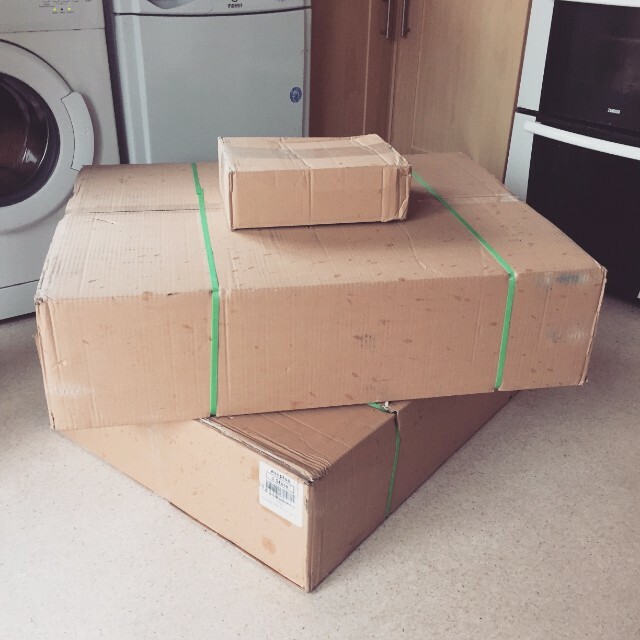 I felt like Christmas this week with the amount of mail we had arriving. The chinchilla sand arrived for the girls but so did this. Eva and I ordered this from Groupon the other week. 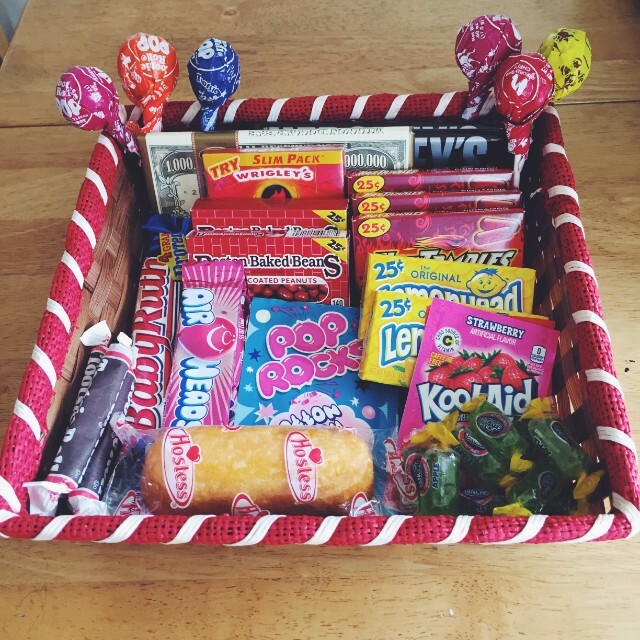 An American Candy basket. We plan to have a movie night and have some munchies. Though we may have started the munchies already... We actually didn't end up in too much of a rush and made it to the Oddyssey in good time. We had a little bit of a wait for everyone to arrive. 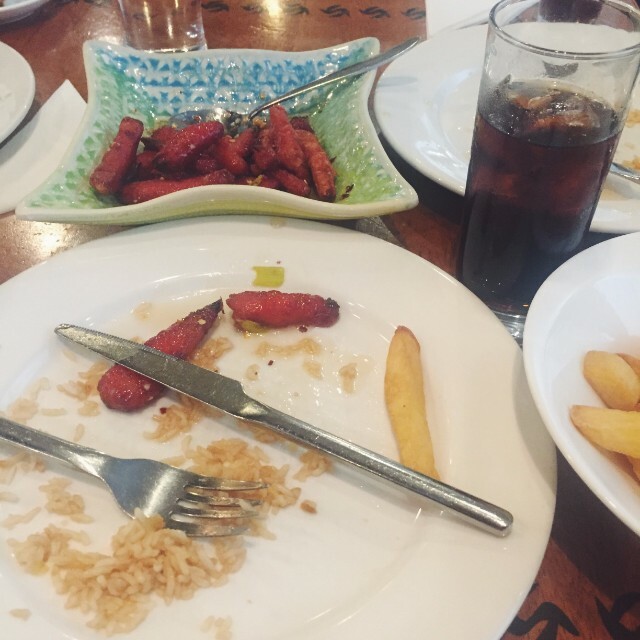 The food was lovely and I had a really good time. I don't have any major regrets or anything I look back on and think I looked like an idiot. I definitely think I'm getting better socially. Eva and I shared honey chilli chicken. It was probably one of the nicest versions I've had of it yet. I forgot to take a photo of it before I tucked in but we ended up leaving a lot since we don't eat very much. One of the girls had her little son with her and he was so gorgeous. I could have kept him! 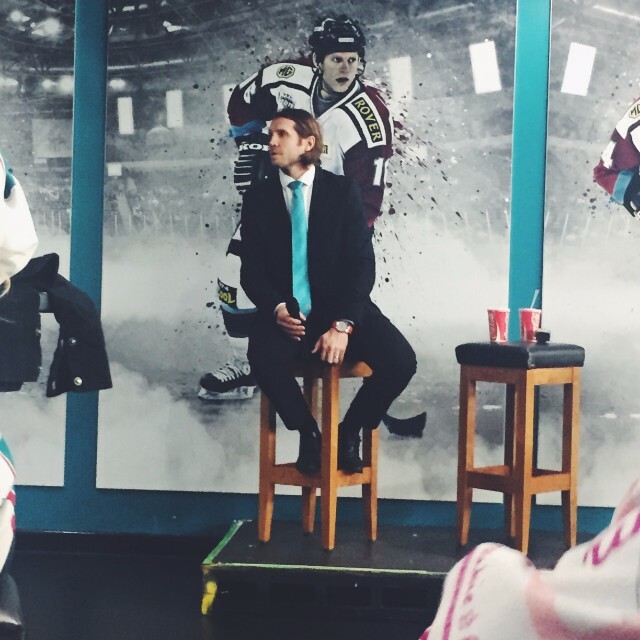 We all arrived at the arena pretty early and in time to catch the Q&A in the bar. Kevin Saurette was the guest as he wasn't playing. I kind of wish I'd made it to more of these. Oh well, there's next season. We just hung out until it was time to go to our seats. Sadly we weren't sitting near the other girls. It was a full bowl last night, they don't usually have seats at the end section, so there wasn't even room for us to sneak over to their section. It was the most people they'd had in 12 years! Nottingham had brought a good crowd with them too. I took a panoramic photo of the arena. There was a bunch of kids in front of us but they were so well behaved. So much better than the men that had been sitting in front of us the couple of weeks before! By the time the game actually started I was pretty shattered and had started to get a headache. By the end I was totally drained, a fact made worse by the fact we lost. We equalised with 20 seconds to go but lost in the shoot out. Eva and I had planned to stay after the game but I was just too tired and too sore. I felt bad we didn't get to say goodbye to the girls but I gave Emma a message on Facebook to explain this morning. Despite how rubbish I felt when I got home I still played with Rue for a while as I'd have felt bad if I didn't. It's not her fault I overdid it! I let her play in my hoody again and then set up her sand bath. She LOVED it. This time I did get a video of her. Here is a little snippet. 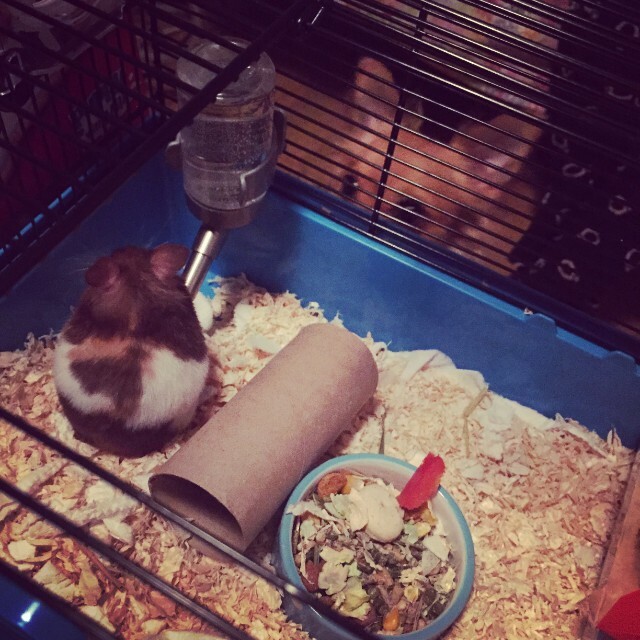 All the things I'm doing for her and seeing her enjoy feels a little bitter sweet because I think of all the things I didn't do for my past hamsters because I was too young to know better or didn't have the resources to find out. I'm trying not to dwell on that though and just make sure I do my best for her. After she came out of the sand I got a photo of her all dusted! 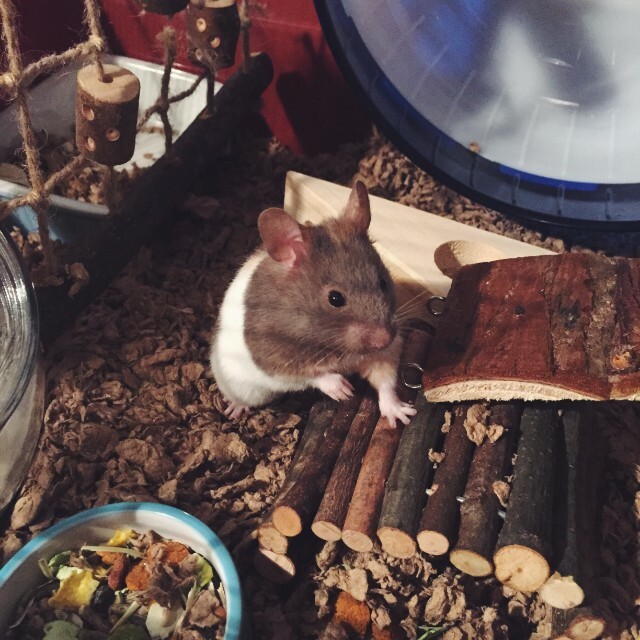 She's such a photogenic little hamster. I can't stop videoing and taking pics of her. So prepare to say many of them! And that was my week. A pretty good one I think. Rue has really made it though. I'm so glad I have her and I really think I got so lucky with her.